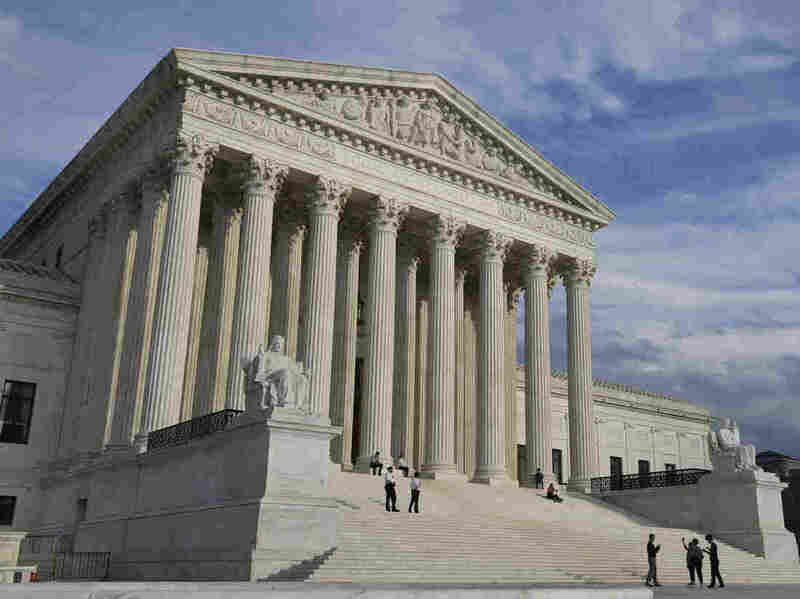 Supreme Court Backs Mandatory Detention Of Immigrants After Serving Sentences The ruling responds to two class-action lawsuits brought by legal immigrants who served criminal sentences and then were detained years later. Writing for the conservative majority, Justice Samuel Alito, said immigration law mandates the detention of "deportable criminal aliens" even if it is years later. Alito wrote that it is "especially hard to swallow" the notion that "the alien must be arrested on the day he walks out of jail." "As we have held time and again, an official's duties are better carried out late than never," he wrote. Writing for the court's dissenting liberal wing, Justice Stephen Breyer warned that the ruling gives the government too much power. The law is clear, he wrote, that the government cannot hold an immigrant without a bail hearing unless the individual is detained when released from criminal custody. "In deciphering the intent of the Congress that wrote this statute, we must decide — in the face of what is, at worst, linguistic ambiguity — whether Congress intended that persons who have long since paid their debt to society would be deprived of their liberty for months or years without the possibility of bail," Breyer wrote. "We cannot decide that question without bearing in mind basic American legal values: the Government's duty not to deprive any 'person' of 'liberty' without 'due process of law,' " he added. The high court's ruling comes in response to two unrelated class-action cases. In one case, Mony Preap, a legal permanent resident from Cambodia was arrested and convicted of marijuana possession in 2006. But he wasn't detained by federal authorities until 2013 following another sentence for battery — a non-deportable offense. Preap remains in the U.S. after successfully challenging his deportation case. In the companion case before the court, Bassam Yusuf Khoury, described in court papers as "a native of Palestine," served a 30-day sentence on a drug charge in 2011. Two years later, federal authorities detained and tried to deport him. He was held for six months before a judge ordered his release. Khoury also won his deportation case and still resides in the U.S. The American Civil Liberties Union represented both plaintiffs. The ACLU's Deputy Legal Director Cecilia Wang said Tuesday's ruling follows another decision last year that limited the rights of immigrants to bond hearings. "For two years in a row now, the Supreme Court has endorsed the most extreme interpretation of immigration detention statutes, allowing mass incarceration of people without any hearing, simply because they are defending themselves against a deportation charge," said Wang in a statement. "We will continue to fight the gross overuse of detention in the immigration system."